The Chinese ereader maker Onyx has been teasing us with visions of their E-ink Android smartphone for well over a year now, and new reports suggest that it is about to hit the market. It's now called the Midia InkPhone, and it is the hot story this week at the CeBIT trade show. 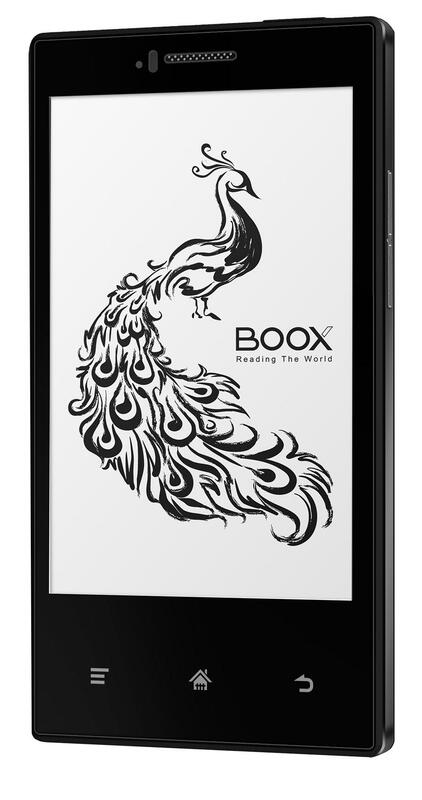 The InkPhone has a 4.3" E-ink screen. The specific details on the current model are scarce, but my latest info (from October 2013) says that the screen resolution is 800 x 480 (specs confirmed by a new press release). This phone is running Android 2.3 Gingerbread on a 1GHz CPU with 512MB RAM, a microSD card slot, Wifi, Bluetooth, and support for EDGE networks. Unlike the Yotaphone, there's no LCD screen. There's also no camera, but given the limitations of the E-ink screen I don't think you would want to take photos with it anyway. 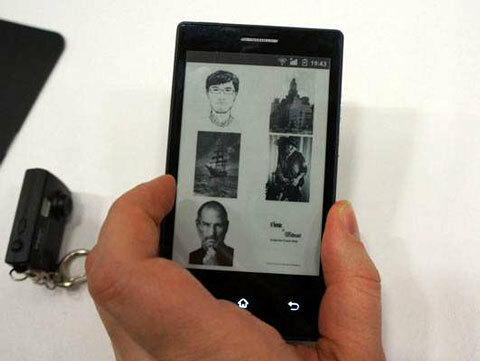 This smartphone was developed by Onyx, but it's being shown off this week by Arta Tech. This Polish firm is a local retail partner for Onyx, and they have committed to releasing the Midia InkPhone in Poland. There's no word on the retail price or release date, but I have learned that Arta Tech initially announced this phone back in December 2013. This story only crossed my desk this morning when Engadget got to play with the InkPhone (those lucky bastards). Engadget says that this phone will ship with only 4GB Flash storage and a Rockchip CPU. They don't have any details on the price, but they did repeat the detail that the InkPhone should run for more than two weeks on a single charge of its 1.8Ah battery. They also posted a gallery of 9 photos. I can't see them for some reason, but you may want to check them out. Update: Engadget is now reporting that the InkPhone is expected to be available in Germany and Poland at some point in April. It'll be priced at around €140 ($195). I think the decision to drop the camera isn’t wise. People want to take photos and then send them to friends/family or post them on social media websites. You only need the screen to see if something is framed properly because that’s about all the control you have with most phone cameras anyway. A spokesperson from the german retailer JAY-tech (own webshop but mostly known for providing devices for some big supermarkets) just told me that they expect the price to be 149,- incl. VAT and that they hope to start selling the E43 this summer. I think I linked to their press release, yes. At the time I wasn’t completely sure this was the E43 and not some other model. Also, that first link doesn’t offer much in the way of useful details. Neither page is very useful, actually.